The Australian Square Kilometer Array Pathfinder uses several telescopes to survey the sky. You know how long it takes to pack the car to go on holidays. But there's a moment when you're all in, everyone has their seatbelt on, you pull out of the drive and you're off. Our ASKAP (Australian Square Kilometre Array Pathfinder) telescope has just pulled out of the drive, so to speak, at its base in Western Australia at the Murchison Radio-astronomy Observatory (MRO), about 315km northeast of Geraldton. 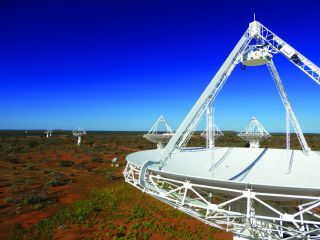 ASKAP is made of 36 identical 12-metre wide dish antennas that all work together, 12 of which are currently in operation. Thirty ASKAP antennas have now been fitted with specialised phased array feeds, the rest will be installed later in 2017. Until now, we'd been taking data mainly to test how ASKAP performs. Having shown the telescope's technical excellence it's now off on its big trip, starting to make observations for the big science projects it'll be doing for the next five years. And it's taking lots of data. Its antennas are now churning out 5.2 terabytes of data per second (about 15 percent of the internet's current data rate). Once out of the telescope, the data is going through a new, almost automatic data-processing system we've developed. It's like a bread-making machine: put in the data, make some choices, press the button and leave it overnight. In the morning you have a nice batch of freshly made images from the telescope. The first project we've been taking data for is one of ASKAP's largest surveys, WALLABY (Widefield ASKAP L-band Legacy All-sky Blind surveY). On board the survey are a happy band of 100-plus scientists – affectionately known as the WALLABIES – from many countries, led by one of our astronomers, Bärbel Koribalski, and Lister Staveley-Smith of the International Centre for Radio Astronomy Research (ICRAR), University of Western Australia. They're aiming to detect and measure neutral hydrogen gas in galaxies over three-quarters of the sky. To see the farthest of these galaxies they'll be looking three billion years back into the universe's past, with a redshift of 0.26. Neutral hydrogen gas in one of the galaxies, IC 5201 in the southern constellation of Grus (The Crane), imaged in early observations for the WALLABY project. Neutral hydrogen – just lonely individual hydrogen atoms floating around – is the basic form of matter in the universe. Galaxies are made up of stars but also dark matter, dust and gas – mostly hydrogen. Some of the hydrogen turns into stars. Although the universe has been busy making stars for most of its 13.7-billion-year life, there's still a fair bit of neutral hydrogen around. In the nearby (low-redshift) universe, most of it hangs out in galaxies. So mapping the neutral hydrogen is a useful way to map the galaxies, which isn't always easy to do with just starlight. But as well as mapping where the galaxies are, we want to know how they live their lives, get on with their neighbours, grow and change over time. When galaxies live together in big groups and clusters they steal gas from each other, a processes called accretion and stripping. Seeing how the hydrogen gas is disturbed or missing tells us what the galaxies have been up to. We can also use the hydrogen signal to work out a lot of a galaxy's individual characteristics, such as its distance, how much gas it contains, its total mass, and how much dark matter it contains. This information is often used in combination with characteristics we learn from studying the light of the galaxy's stars. ASKAP sees large pieces of sky with a field of view of 30 square degrees. The WALLABY team will observe 1,200 of these fields. Each field contains about 500 galaxies detectable in neutral hydrogen, giving a total of 600,000 galaxies. One of the first fields targeted by WALLABY, the NGC 7232 galaxy group. This image (above) of the NGC 7232 galaxy group was made with just two nights' worth of data. ASKAP has now made 150 hours of observations of this field, which has been found to contain 2,300 radio sources (the white dots), almost all of them galaxies. It has also observed a second field, one containing the Fornax cluster of galaxies, and started on two more fields over the Christmas and New Year period. Even more will be dug up by targeted searches. Simply detecting all the WALLABY galaxies will take more than two years, and interpreting the data even longer. ASKAP's data will live in a huge archive that astronomers will sift through over many years with the help of supercomputers at the Pawsey Centre in Perth, Western Australia. ASKAP has nine other big survey projects planned, so this is just the beginning of the journey. It's really a very exciting time for ASKAP and the more than 350 international scientists who'll be working with it. Who knows where this Big Trip will take them, and what they'll find along the way?